The small town of Malmedy (pop. 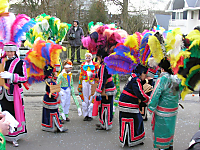 11,400) is not much of a tourist destination, apart from its famous carnival in February. 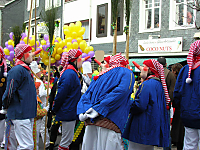 The festival is known as Cwarmé and is held from the Saturday preceding Shrove Tuesday to Shrove Tuesday. 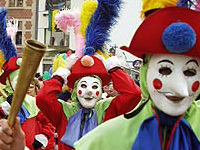 The masked Haguètes wielding long wooden pincers called hapes-tchar are the highlight of the Sunday parade. 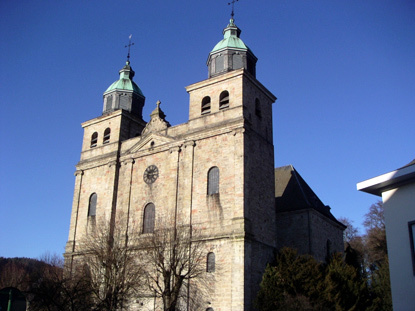 Malmedy is said to have been founded in 648 by St.Remacle, who established a convent there. The town's history has been intimately bound to the one of nearby abbey-town of Stavelot since the Middle Ages. After Napoleon's defeat at Waterloo in 1815, most of present-day Belgium became part of the United Kingdom of the Netherlands, but Malmedy and Stavelot went to Prussia. In 1920, Malmedy was incorporated Belgium as one of the areas redeemed by Germany after WWI. Nowadays, inhabitants of Malmedy speak both German an French. The two museums in town are the Cwarmé Museum (open Tue-Sun 2-5pm; entry 2.5 €) or the National Paper Museum, which tells visitors all they ever wanted to learn about one of Malmedy's traditional industry : paper. Another reason to visit Malmedy is for the Belgian Formula One Grand Prix of Spa-Francorchamps, held the last week of August, which actually runs between Francorchamps, Malmedy and Stavelot (and not in Spa, as its name would suggest). The nearby castle of Reinhardstein should not be missed if you happen to pass through Malmedy. There are no trains to Malmedy. The nearest station is Trois-Ponts (52min from Liege), 20min away by bus from Malmedy. Regional bus 395 from and to Verviers runs about 8 times a day. By car, Malmedy is on the E421 (Verviers-Prüm) motorway, exit 11.